Banstead Botany Blog: A knotty find. Strolling around Park Downs the other evening I noticed a small white flower (above), on the path, just another Purging Flax I thought, but no it was larger than that (probably why I noticed it) although still less than 1cm across. On closer inspection it turned out to be the flower of Sagina nodosa, Knotted Pearlwort. This is a very delicate plant with terminal flowers on stems that bear very small linear leaves clasping the stem that give the "knotted" feel when you run it through your fingers, you might just be able to see it in the picture above. Try getting an in-focus picture of the stem. If you look in any British flora it will tell you something along the lines (to quote Clapham, Tutin and Warburg, I live in the past) "Frequent in damp sandy and peaty places throughout the British Isles". So what is it doing on dry chalk downland? In fact in Surrey it seems it does things differently. In Lousley's Flora of Surrey (1976) it is described as very rare, only recorded at three sites in the recent past, two of which were on chalk including Banstead Downs up until about ten years ago. As far as I know it was first recorded on Park Downs in the early 1980s about 100 m from where I found it and had not been seen for about fifteen years. It was thought possibly to have been imported with gravel used to repair the path it grew on. 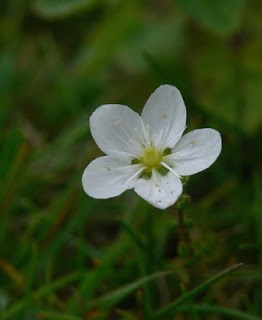 However I remembered that last year I had photographed a small white flower on another path on Park Downs and promptly forgot all about it. I dug it out and sure enough there it was (below) Knotted Pearlwort, so back to Park Downs and last night I found it again in the same place on a path some 100m from the other two sites. The fact that it is still present across quite a large area perhaps that even if it got here by man's hand it can survive quite happily. Certainly not an obligate calcifuge. Of course strictly a non-native in this context!!!!!!! Later this week I shall inspect Banstead Downs to see if I can find it there. Watch this space. A good bit of sleuthing, resulting in an interesting report. Good luck searching the downs. John, you keep finding and mentioning species from the area that I have yet to see locally - an inspiration to make me look harder and a lesson that I obviously miss an awful lot! Ah but I see no birds cos I am always looking at the floor! !